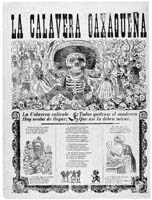 Organized by the University of Hawaii Art Gallery, My Mexico presents the works of a cultural icon and one of Mexico's most famous artists, Jose Guadalupe Posada. The collection comes from the artist Jean Charlot, who championed Posada's work following his death in relative anonymity. Posada satirized and glorified people of all classes in his work; his most popular images are the calaveras, or satirical skeletons produced for the Day of the Dead, celebrated in Mexico on November 2. Purdue Galleries will collaborate with the Purdue Latino Cultural Center to present programming in connection with the exhibit tying it to the celebration of Dia de los Muertos, or Day of the Dead. An altar or ofrenda to Posada will be assembled in the Stewart Center Gallery by Eileen Garcia, scenic artist and properties manager for Purdue Theatre. The ofrenda is the focal point of Dia de los Muertos celebrations. Join us in the Stewart Center Gallery for Jose Guadalupe Posada and His Times, a lecture by Floyd Merrell, professor of Spanish and Semiotics in the Department of Foreign Languages and Literature. Dr. Merrell will discuss Posada's work in the historical context leading up to and including the initial stages of the Mexican Revolution. There will be an open reception following the lecture. Purdue University Latino Cultural Center will present Dia de los Muertos, Una Celebracion de la Vida (Day of the Dead, A Celebration of Life) at the Morton Community Center (Rooms 106 & 108) 222 N. Chauncey Avenue in West Lafayette, Indiana. Craft stations will be set up to provide children and adults the opportunity to learn how to make sugar skulls, paper flowers, puppet skeletons, and masks. Several Dia de los Muertos altars will be on view and music will be playing throughout the day.